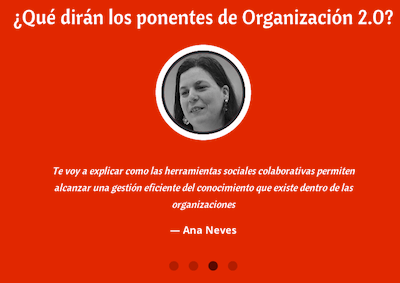 Ana Neves is presenting at Organización 2.0. The event is taking place 22th October, in Vigo (Spain). She will be showing how social tools can support organisational knowledge management. The event is organised by Comasis and Innova. The two companies expect representatives of medium and large companies, both public and private, from the Spanish region of Galicia.